Almost everybody in the world has seen the photograph above. It shows a building struck by a mortar shell during the Warsaw Uprising of 1944 and it became one of its most recognisable symbols in the media. Meanwhile, most people interested in WWII or the history of Poland in general know that the siege and eventual seizure of the high-rise called PAST-a was a strategically crucial and highly meaningful point of the 63-day-long uprising, a symbol of its glorious beginning. But is it the same building? Before WWII there were two high-rises towering above the homogeneous tenement-house landscape of Warsaw. The first one was built between 1907-1910 by Swedish telecommunications company Cedergren. Designed by an international duo comprising of Bronisław Brochwicz-Rogoyski and Izaak Classon, on the day of its completion it was the highest building in the Russian Empire (which occupied Warsaw until 1918). It was also a rare example of a combination of modernist and historicist ideas as its creators drew inspiration from medieval towers. In 1922 the building was taken over by the Polish Telephone Joint-stock Company (shortened Polish name – PAST-a), thus has been known as the PAST-a building hereafter and became the facility where the main telephone switchboard for domestic and international calls was located. By 1933, only a mile to the south, the art déco Prudential building was finished and it toppled the PAST-a from its number one spot on the list of Warsaw's highest buildings. The 16-floor, 66-metre high-rise quickly became a symbol of the modernist inter-war Warsaw. Despite serving as the Prudential Company’s headquarters it had luxury apartments on its highest floors, offices for rent and a small power plant in the basement. In 1936, the very first television transmitter in Poland was installed on its roof. 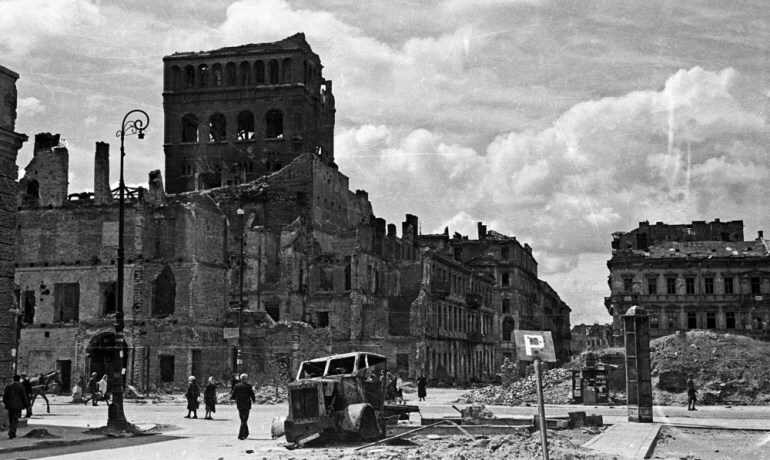 Instantly seizing Warsaw was the first task of Hitler’s blitzkrieg, thus from 1st September 1939, the city was gradually turned to ash and suffered from bombings, mortar shells, airstrikes and the deliberate demolishing of selected key buildings. The siege of Warsaw ended on 1st October and was followed by four years of Nazi occupation. In 1944, the Warsaw Uprising started and the city was to bear witness to a ferocious battle between two desperate armies for 63 days. The PAST-a immediately became one of the strongholds of the German army. On the first day of the uprising, it was boarded up, abundantly supplied and over 120 SS men were stationed there to defend it. It soon became the only island of German defence in the centre of Warsaw, which was entirely controlled by Polish insurgents. It was however a thorn in rising Warsaw’s side, because Nazi snipers had a great view of the entire Marszałkowska Street and fired often and without warning, even at civilians. Moreover, the building and its telephone switchboard were fully operational and served the Germans as a communication centre. The insurgent army started besieging the PAST-a and gradually cut it off from any supplies from nearby Nazi outposts. Subsequent assaults were, however, unsuccessful due to a vehement defence and the fact that the attackers didn’t want to set the building on fire in order to be able to use the telephone switchboard after it was captured. Skirmishes, assaults, and the German efforts to rescue or supply the soldiers defending the building were the dominant factor of the fights in the centre of Warsaw for three weeks. Eventually, on 20th August, an assault by the joined forces of several insurgents’ units, preceded by setting the lower three floors of the building ablaze, was successful. Over 100 Nazi German soldiers were captured and the last point of Nazi resistance was suppressed. Capturing the PAST-a became a symbol of the uprising’s successful first days and an important part of the legend of the uprising in the years to come. The building was reconstructed and at the turn of the century was given to the Foundation of the Polish Underground State. However the PAST-a is not the building immortalized on the famous picture above. That is the Prudential building, and the photo was taken exactly at the moment of it being hit by a 2-tonne mortar shell. The Prudential, just like the PAST-a, was almost entirely demolished during the uprising but unlike the PAST-a never became a strategic point or permanent outpost for any of the hostile armies. The remnants of Prudential had such a woeful look that photos of it spread in the worldwide newspapers as a symbol of the fall of a great city. Nevertheless, the Prudential, thanks to its being constructed on a steel frame that survived bombings, was reconstructed as soon as in 1950-1953 and still towers above the same square… with only the name of the square changed: from Napoleon Square to Insurgents’ Square.